Hello everyone, sorry for the delay in posting. My schedule has become tremendously hectic so my posts will be much less frequent. Regardless, I have been checking in on the statistics and I appreciate everyone who has continued to read, submit, and share this blog even as my posts have become less frequent. We are fast approaching 3000 views; I am hoping this post puts us over the top. Well Jim, this is an excellent question. Most people, I’d imagine, don’t really have a very detailed understanding of what constitutes blood, what those things do, and how blood gets from place to place. The individual cells that make up the functional parts of the blood fall into three classes, erythrocytes (red blood cells), leukocytes (white blood cells of various types), and thrombocytes (platelets). These cells all originate in the bone marrow, from a common stem cell known as a hematopoietic stem cell (HSC). These stem cells give rise to two classes of cells, myeloid and lymphoid progenitor cells. Myeloid cells create, among other things, red blood cells, megakaryocyte (which breaks up into platelets), and a fair number of white blood cells. Lymphoid cells create a particular class of cells known as lymphocytes, which are our already familiar B cells and T cells (if you have not been reading and don’t know what these are, view this search), and a new type of T cell we have yet to mention known as a natural killer (NK) cell. Once all of these cells are made, they have to travel in a medium of some sort. If they didn’t, they would be far too viscous to travel through even large blood vessels easily. This medium, as you might know, is known as plasma. What you might not know is that plasma is far more complex than just simply the watery substance that carries blood cells. Well balanced plasma is as essential as any other part of the blood. There are a few essential characteristics of blood plasma that make it so important. Primary among these are the dissolved substances. Blood plasma carries a tremendous amount of things in it, from dissolved gasses to protein to hormones. Every piece is so incredibly important that four organs, the kidneys, lungs, pancreas, and liver, are devoted to maintaining this balance in every possible way. One of the most important elements of what makes up blood plasma is protein concentration. Chief among these proteins is albumin, of egg white fame. Albumin is made in the liver and is the main protein we use to maintain what is known as oncotic pressure. Regulating this pressure maintains a proper fluid exchange between the blood and the tissues; too much albumin and fluid flows into the blood, too little and it flows into the tissues. People who have liver failure, for example, can suffer from severe generalized swelling as the liver is unable to make enough albumin and other proteins to maintain proper oncotic pressure. Albumin is also responsible for allowing some drugs to be able to travel in the blood by binding to them. Another vital piece of the puzzle is blood pH, or level of acidity. Blood is maintained at a very narrow normal range between 7.35 and 7.45. Any severe disturbance of this range (above 7.45, known as alkalosis, or below 7.35, known as acidosis) can cause dramatic health issues, primarily due to altered or impaired enzyme activity among other physiological processes. The body regulates pH through a bicarbonate buffer system (buffers prevent rapid changes in pH), which has its roots in carbon dioxide. Without going into too much detail, increased carbon dioxide in the blood can shift the buffer balance and cause acidosis. People with acidosis, as with uncontrolled type one diabetics, have characteristic rapid, deep breathing as the body attempts to release more carbon dioxide and increase the pH. Likewise, alkalosis can cause a reduced breathing rate as the body tries to hold onto carbon dioxide. Electrolytes, such as sodium, potassium, calcium, and so on circulate at carefully controlled levels. Even small variations to these levels can have dramatic effects on the body. As I mentioned before, gasses can also be dissolved directly in the blood. 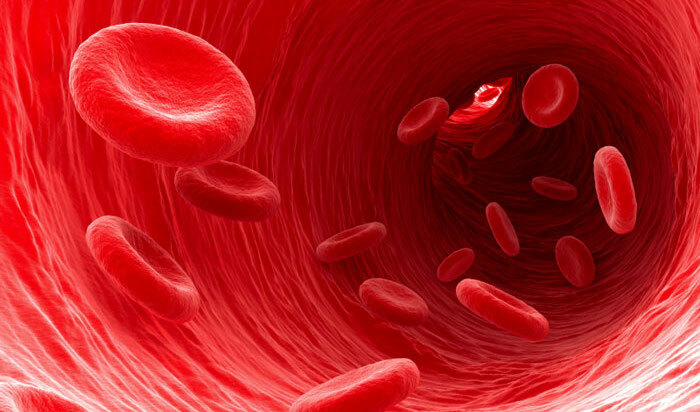 Importantly, most people think red blood cells are the only way oxygen is transported through the body. But, oxygen can also be directly dissolved in the blood. Lipoproteins, which are combinations of fat and protein, travel in the blood to bring essential elements such as cholesterol around the body. These are the elements that most people refer to as “cholesterol” on a blood test. In a future post, I will likely cover the different types of lipoproteins and their effect on health. Hormones: Probably the most familiar of these elements, have various sources and functions. Not important to have specifics unless you’re curious. At this level, just know that the blood is their main method of travel. Please note that this is a very basic picture of the blood. Blood is a very complex system, so complex even that there are entirely medical specialties devoted specifically to it. So I encourage you to use this as a basic primer for further, more detailed research. Hope this helps! As always, feel free to submit questions. Thank you for reading!